Stand back Tom Clancy fans, the Xbox 360/PS3 console war is starting get a little off the wall and your being taken for the ride. Today Xbox announced that GOLD members will be able to download the demo for Tom Clancy's H.A.W.X as of February 11 at 2:00 A.M. Pacific Time. The catch is - it is an extremely short timed exclusive - 1 day to be exact. So all you PS3 gamers out there just relax and enjoy your day go play the Killzone 2 demo and then pick-up H.A.W.X from PSN on the 12th. 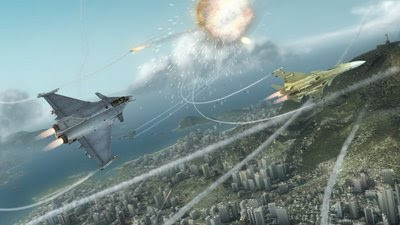 Just be glad you're not a PC gamer as they have to wait until February 26 to get their hands on this dogfight sim. For more information on Tom Clancy's H.A.W.X, visit: http://www.hawxgame.com or www.ubi.com.